In celebration of President’s Week, I thought it would be fun to take a look at what was sometimes on their tables. President George Washington was known to be an avid duck hunter, so a simple roasted duck was sometimes served at his dinner table. 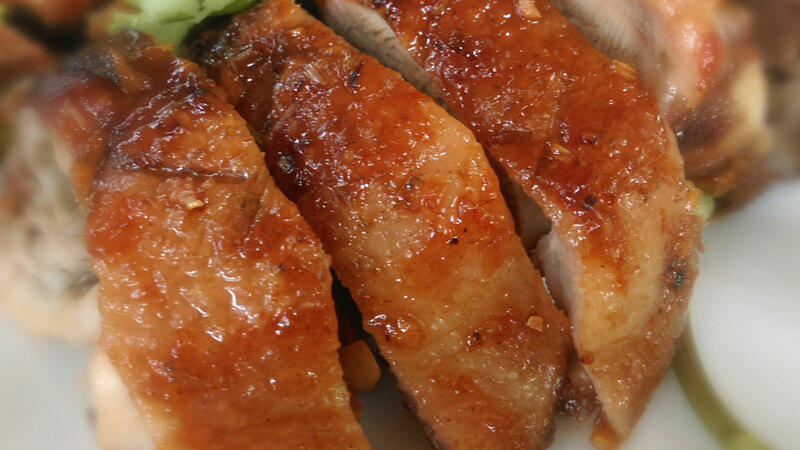 I love a good roasted duck but find that many are a little afraid of making it. This particular recipe from Lidia Cooks from the Heart of Italy (Alfred A. Knopf, 2003) calls for only a few ingredients, and the oven does most of the work. Serve with braised vegetables or a refreshing salad. You will need kitchen twine; heavy-duty flameproof roasting pan with a flat wire roasting rack, preferably just big enough to hold the duck with an inch or so empty space around it; a fat-separating measuring cup (2 cups or larger); poultry shears or heavy knife for splitting the duck. Arrange a rack in the middle of the oven, and heat to 400 degrees. Remove all clods of fat from the duck cavities, and trim any loose flaps of skin. Rinse the bird, including the giblets and neck, and pat dry with paper towels. Sprinkle a teaspoon of the salt inside the belly cavity, and push in the rosemary sprigs. With the breast side up, twist and fold the wing tips so they stay in place under the bird. Cross the legs over the cavity opening and tie the ends together tightly with kitchen twine. Chop the duck neck into two or three pieces, and scatter in the bottom of the pan, along with the giblets, under or around the wire rack. Set the duck, breast side up, on the roasting rack in the pan. Whisk the wine, lemon juice, and olive oil vigorously together until emulsified, and pour this all over the duck skin. Sprinkle the remaining 2 teaspoons salt over the bird, making sure that the sides are moistened and salted as well as the breast. Roast the duck for an hour, breast up, then baste it all over with the pan juices, using a bulb baster or large spoon—tilt the roasting pan carefully to scoop up the liquid. Continue to roast for another 1 to 1½ hours, basting the bird every 30 minutes or so, until it is dark gold and very crisp all over. Remove the duck to a platter, take out the rack, and gather the giblets and neck pieces onto the platter, too. Carefully pour the hot juices from the pan into a fat separator (or other heatproof container), and let the fat gather on top. Pour the good juices out of the separator into the roasting pan—if you don’t have a separator, spoon off all the fat first—then pour in a cup or more of stock, so you have at least 1½ cups liquid to deglaze the pan and cook into sauce. Set the roasting pan over medium-high heat on top of the stove, and bring the liquids to a boil, vigorously scraping up all the caramelized bits on the bottom of the pan. Let the juices reduce until slightly thickened and flavorful, then turn off the heat. In the meantime cut up the duck into small pieces to serve family-style: First split open the breast, cutting through the center of the breast bone with poultry shears or a chef ’s knife. Cut along the backbone to divide the bird in half, then slice each half into a wing, leg, thigh, and two or three breast pieces. Pile the cut pieces on a serving platter, along with the roasted neck and giblet morsels. Keep warm and when the sauce is ready pour the pan sauce all over. Let people take the pieces they like the most. To quarter the duck to serve four: Split it in two as above, cutting along both sides of the backbone so it can be removed. Divide each duck half into a breast piece and a joined leg and thigh, set each quarter on a warm dinner plate, and nap with the pan sauce.